(PHOTO BY ALAN NASH) Izzy (Hannah Marks, far left) clearly doesn’t want to hear what Hannah the matchmaker (Betsy Lichtman, far right) is saying in the Levis JCC Sandler Center Theater production of Crossing Delancey. 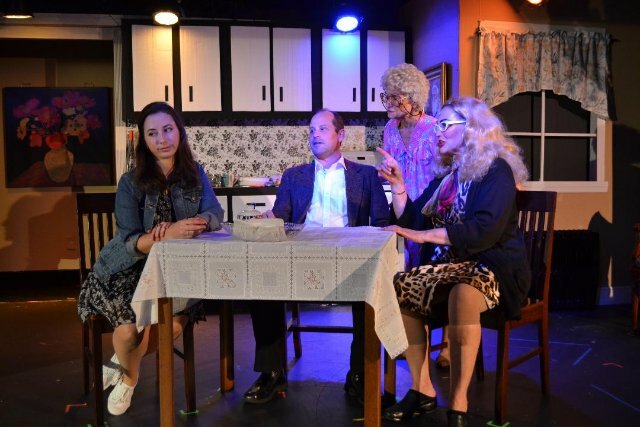 Pictured between Izzy and Hannah are Sam (Mark Kirschenbaum) and Bubbie (Fern Katz). The woman with long blonde hair, owlish-like sunglasses and a loud voice that becomes gravelly at times speaks as though she’s almost deaf. Moreover, it would appear that she thinks the same is true for everyone else. Further, there’s an unmistakable Yiddish inflection and exaggerated New York accent emanating from that voice. Frankly, it might border on annoying for some. But it’s hard to hold a grudge against her. Surely, you forgive her when she, in that same tone, addresses her friend as “Idella,” using an endearing Yiddish nickname for “Ida.” And when she walks, somewhat hunched over, pushing a cart that you might mistaken for a walker, she somehow becomes endearing. Still, you have to wonder: Has Yenta the Matchmaker immigrated to America and taken a drug that has rendered her younger and eccentric? Or, you might ask, is this really Dolly Gallagher Levi on that same drug? When it comes to belly laughs at the Levis JCC Sandler Center Theater at the J these days, Call--On--Hannah! That would be Hannah Mandelbaum, the well-meaning motormouth of a matchmaker in the uplifting Crossing Delancey. In particular, the irresistible Mrs. Mandelbaum to whom we are referring is actually Betsy Lichtman. She plays the marriage broker in the Sandler Center’s charming and hilarious production of the crowd-pleasing stage play, Crossing Delancey, the source material for the 1988 movie with the same title, starring Amy Irving. The Sandler Center’s uplifting, heart-warming mounting of the play runs through March 24 in the intimate Beifield Auditorium. True, Lichtman’s Hannah is somewhat of a caricature. And the performer might appear a tad young for the part. Even so, Lichtman doesn’t beg for laughs. Rather, the actor makes this matchmaker’s comicality seem organic. Also, Lichtman does not upstage the other performers. That is vital, since Crossing Delancey is an ensemble piece, with five important characters, pared down from more in the movie. Surely, “Bubbie,” (a superb Fern Katz) is an essential part of the play’s quintet of characters. This grandma represents the “Old World” way of thinking and doing things. Everything from her old-fashioned Jewish cuisine to her unbending belief in the necessity of marriage and enlisting a matchmaker suggests holding fast to tradition and a bygone era. Naturally, even in the late 80’s, when Susan Sandler wrote the movie’s screenplay, matchmaking seemed a relic from the past. And, of course these days, what with match.com, chatrooms and just about every technological aid in finding Mr. or Mrs. Right available, the idea of a matchmaker will undoubtedly raise eyebrows. Nevertheless, the presence of such a person doesn’t render Crossing Delancey a museum piece. For modern relevance, look, for instance, at the inner strength of the female characters. Also, there’s an inner conflict between honoring the past and living within and participating fully in a modern society, with vastly different ideals, values and beliefs. No doubt, such a struggle is part of what makes Fiddler on the Roof timeless and Crossing Delancey shares commonalities with the classic musical. Indeed, Izzy must seem like she is about to lose her arms. On one side, her Bubbie and the matchmaker, as well as the man the latter picked for her as her future husband, are pulling her downtown, toward Delancey Street. It represents in some respects, a distant past. On the other side, Izzy surely feels a magnetic-like draw away from Delancey, toward a chic, modern Uptown Manhattan, complete with the intelligentsia. There, she works in a bookstore. She finds all its books, the chance to date an accomplished author and live independently quite tempting. At the same time, Izzy finds warmth and comfort in Bubbie’s stories, cooking, hugs and caresses. What’s a young woman such as Izzy to do? To her credit, Hannah Marks skillfully navigates Izzy’s inner conflict between the comforts of the “old world” and the enticements of modern, upscale society. Marks marvels in the role, disappearing into Izzy’s skin. While she is uptown, her dreamy, shining eyes and expressive eyebrows deftly conveys her fantasy romance with author Tyler Moss (Om Jae). Meanwhile, Marks imbues Izzy with compassion, concern and joy while visiting her Bubbie. The actor’s bright smile reinforces how much happiness she experiences while at Bubbie’s house. That’s not to say that the older woman doesn’t get on Izzy’s nerves – she does. And when this happens, Marks is careful not to exude any hint of rudeness or anger. Instead, it’s almost as if she bites her tongue and her lip while controlling herself. She can sing and dance quite well, too, never mind her age! In a multifaceted, convincing performance, Katz is equally up to the task of giving Bubbie an adamancy and commanding presence when necessary. After all, this woman has strong convictions and opinions. Further, she’s no pushover, despite her small stature. Bubbie and the matchmaker have got their eye on Sam, a pickle salesman played with nervous energy by Mark Kirschenbaum. However, Izzy doesn’t particularly like Sam. Sam, a complex character, undergoes the biggest change in the play. And, to his credit, Kirschenbaum seamlessly transitions from a nebbish bound into a knot of nerves to a relaxed, convivial and charming man who loves life. By contrast, uptown author Tyler Moss is perhaps the play’s most one-sided character. He’s clearly an intellectual in love with himself. Om Jae puts on superior airs as Moss, endowing him with a stuck-up demeanor that’s off-putting. Think a darker-skinned Johnny Depp. Jae, with shoulder-length long hair, turns around with a flourish, suggesting arrogance. Even so, Jae gives Moss more than a hint of charm and seduction. Therefore, it’s clear why Izzy is attracted to this accomplished man. Speaking of accomplishments, cast members aren’t the only ones deserving kudos. Credit, for instance, the scenic design (uncredited). The uptown bookstore, Bubbie’s apartment, and a downtown park bench are situated adjacent to each other onstage, allowing for seamless transitions between scenes. While these locations are next to each other, they might as well be worlds apart given the differences between Bubbie’s world and Uptown. Director Alan Nash finds the comedy in Crossing Delancey. He does so without making the show merely a vehicle for one-liners (and there are plenty memorable ones). Nash and co-director Holly Budney aid the cast in discovering the heart and soul of the piece. In addition, the love between Bubbie and Izzy is sincere and touching. So, too, are the romantic scenes. Nash, who also designed the lighting and sound, has created appropriate hues for romantic moments, as well as realistic and fantasy scenes. Unlike in the movie, Izzy addresses the audience at times and has imaginary conversations with Moss. Reality and fantasy, as well as past and present, collide in this charming, heartwarming play. While it’s different than the movie, the play is faithful enough to equally delight fans of the film. Crossing Delancey continues through March 24 at the Levis JCC Phyllis & Harvey Sandler Center, 21050 9th Avenue S. in Boca Raton. Showtimes are 2 and 7:30 p.m. Thursday, March 21 as well as 7:30 p.m. Saturday, March 23 and 2 p.m. Sunday, March 24. For tickets, call (561) 558-2520 or visit levisjcc.org/sandlercenter.